LinkedIn app is a right solution if dependence on location is not for you. Standing in a queue, shopping, waiting for a friend or just walking – you can have an access to your professional network everywhere with LinkedIn app. With LinkedIn Connected you can find all important information in the news feed about your connections. This LinkedIn app notifies you about content your friends are sharing, actual updates and much more, so you will not miss anything. Also this app gives you an ability to focus on the people who matter the most for you with relevant updates. Do not stop looking for a job even when you're not at the computer. Every second a huge number of employers and job seekers communicate with each other, time is running out, so you should always stay connected. 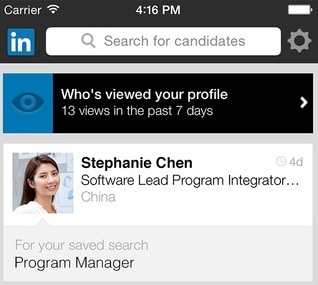 Get LinkedIn app and look for a job using keywords and location, and then apply for interesting jobs. It is important to mention that all your actions are confidential – your connections will not get notifications. It is a LinkedIn app that brings you latest news. It allows you to customize news and view only the most interesting. Also you can share favorite content with social networks such as LinkedIn, Twitter, Facebook, YouTube, Flickr, and Tumblr. Are you looking for a great candidate and still can’t find? Increase chances: don’t miss an opportunity because of absence from workplace: continue seeking when out of office. Browse through profiles of candidates and respond to their messages with LinkedIn app for recruiting. Check out profiles, get updates and send messages to continue building business relationships. 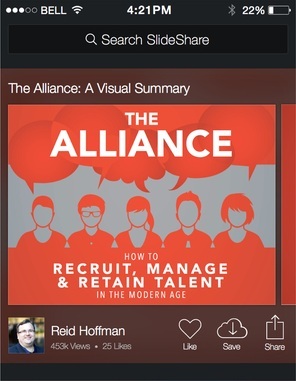 To use this app a Sales Navigator account is needed (it is a paid LinkedIn subscription). You can explore over 15 million professional presentations, infographics, and videos.When you’ve found something really interesting and have no time to read it right now, don’t worry, you can save this information and continue later (even offline). These LinkedIn apps have all you need to run your business life on the go: read news feed, explore jobs, follow favorite communities, and benefit from other useful features.Be mobile. Stay in touch with LinkedIn app.